When trainer Danny O’Brien put in the winning bid at $155,000 for an O’Reilly colt in New Zealand two years ago, he didn’t know exactly what he was taking home. For O’Brien had enjoyed plenty of luck with the O’Reilly stock. He’d won a 2400-metre Caulfield Cup with Master O’Reilly back in 2007 and a 1200-metre Newmarket Handicap at Flemington in 2013 with Shamexpress. But horseracing rarely fails to surprise and so it proved with this colt, who goes under the name of Tyrannize. 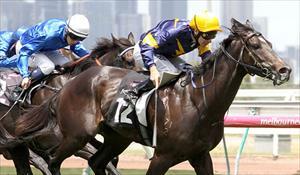 At just his fourth start at Flemington, Tyrannize sizzled up the straight 1200m course to win comfortably. The result was hardly a surprising one for O’Brien nor for punters, who backed him in from $10 to $7. I thought he’d be near favourite in the race on what he’d done and I told the owners they (bookmakers) don’t always get it right,” O’Brien said. The trainer said he would pick out a similar race for the three-year-old in coming weeks in the hope Tyrannize might improve further. “It’s a good time of year for these sort of lightly-raced horses to learn and maybe can bounce off some summer form into the autumn,” he said.